We are happy that you are here, and we hope you will find the musical instrument of your dreams. We have made every effort to provide you with the finest instrument at the lowest possible price. We strive to provide the best possible service that you would expect when searching for your dream piano or instrument. Cornerstone Music Sdn Bhd is a Authorized Dealer For YAMAHA, LINE 6, Epiphone, Gibson and Fender. We has a large selection of Yamaha Grand & Upright Piano, Clavinova Digital Piano, Guitars, Accosutic & Digital Drums And many more. Kindly call us for appoinment of Private Piano Trying Session.Successful Purchaser is entitled to Claim Hotel Expenses Up To RM500 and Free Gift. Hotel Accomodation Claim RM500 for Piano Trying Session upon succesful Purchase. 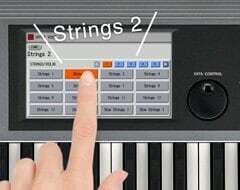 Super Articulation Voices have been included which realistically reproduce the characteristic techniques used in playing wind, string, and other acoustic instruments, according to keyboard touch and playing style. AEM is Yamaha’s proprietary tone generation technology. AEM selects, in real time, the optimal sampled data for the piece being performed, recreating the smooth, natural sounds of acoustical instruments. AEM is used in some of the Super Articulation Voices. A single tone can be produced by layering up to eight different wave types. This not only adds depth to the sound, but with variations in length and touch, can provide a wide range of expressions. 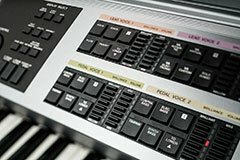 The three keyboards can sound up to eight types of tones simultaneously, enabling the player to recreate the rich, heavy sound of an orchestra. Adding delay, distortion and other effects brings out a whole new range of expressive possibilities. The ELS-02/02C includes a wide variety of effects, with 16 categories and 308 types offering the player the freedom to combine effects and make detailed adjustments. Voice Condition settings for each Voice can be registered in “Voice Link” and displayed on a single screen, where they can be called up for each of the Voice Sections. Because Condition settings are also linked, there is no need to repeatedly copy settings for each Section, making the registration process much faster. The Voice Edit feature makes it possible to change the tone and volume of each Voice, enabling the player to create original Voices. Note: Super Articulation Voices cannot be edited. Diverse rhythms bring the world’s music closer. 634 types of rhythm patterns. Preset, realistic rhythm patterns have been sampled from actual percussion instruments. From standard patterns to those reflecting today’s musical styles, the Electone offers a diversity of rhythm patterns that work with music from around the world. The Rhythm Program lets the player edit existing patterns as well as create entirely original patterns. Note: Some preset patterns cannot be edited. 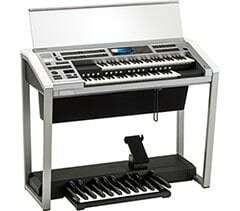 A wide variety of percussion sounds and effects can be called up from the keyboards, making it possible to play percussion sounds from the Upper and Lower keyboards and Pedalboard. 40 sets per Unit are available for users to decide which sounds they wish to assign to each keyboard. Up to two sets can be used simultaneously. Recreate a wide variety of musical styles. A wide range of combinations can be called up instantly using a single button, with five Registration Banks each consisting of 16 memories available, enabling the user to store a maximum of 80 (16 x 5) original Registrations. Smoothly switch between Registrations using the Registration Memory buttons, the footswitch, or the Registration Sequence. Additional Units can be stored as needed. Select and call up Registrations by musical genre for immediate, realistic performance. The Custom model offers 566 varieties to choose from, while the Standard model includes 506 menu selections. "Simple Registrations" can be used for improvisation, or to supply basic components when creating original Registrations. Data from the ELS-01 series can be used as well. Data created or purchased for the ELS-01 series can also be used with the ELS-02 series. 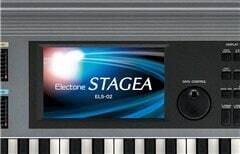 Voices and Rhythms from the ELS-01 series are included in the ELS-02 under the same names (some numbers may have been added or other slight changes made). Note: Data for Drum and Percussion pitches set high may not reproduce at the same pitch. Note: Sound transitions are now more natural for Lead Voice timbres when playing Legato or using the Slide function. Note: Because of faster data reading speeds, some data may require adjustment. The audio recording function is handy when you want to play your music on the computer or record it onto a CD. 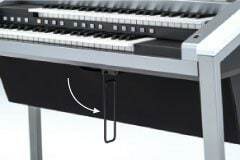 The MDR recording function enables recording of keyboard playing by parts, as well as altering the tone and re-recording selected sections of the initial recording. Note: Please use the USB flash drives noted on the list of drives whose performance have been verified by Yamaha. For more details, please visit your local Yamaha website. 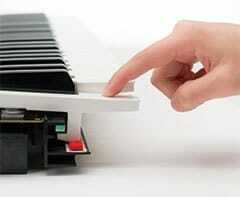 Only Yamaha could create a keyboard this sensitive to the player. The Standard model keyboard. Initial Touch can be used to control volume and timbre according to how hard the keys are struck, while After Touch controls them according to pressure applied to the keys after playing. Sensors ensure the player’s full emotional expression is conveyed from the fingertips to the keyboard. In addition to Initial Touch features, the Pedalboard also enables legato and polyphonic play. A Wide Range of Features for Full Body Control. This pedal is used to control overall volume and add expressiveness to the music. Assigning a variety of functions to the left and right Footswitches gives the player effective, real-time control over their performance. They can also be used to switch between Registrations and to control rhythm. knee. It can be used to control the Sustain effect, or to switch the Upper Keyboard between solo and Melody on Chord play. The lever can be folded away when not in use. Optimized for Player Movement, With Playability the Goal. Buttons are all easy to press, and are carefully arranged to allow the player to concentrate on the performance. The frame is constructed to ensure pedal play is visible from any direction. The entire instrument is angled forward toward the player, creating a more dynamic appearance for the listener. A large, 7-inch LCD touch panel is easily visible from the player’s position. Combining it with the data control dial immediately adjacent enables intuitive operation of the controls. Tones of white, black and silver create an impression of intrepid strength. The coloring not only works well with any home interior, but builds even greater excitement for a player on stage. Accurate sound, delivered to both player and audience. 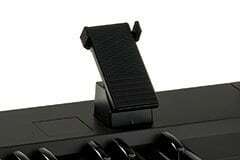 Speaker unit is located under the keyboard, and represents the culmination of sophisticated Yamaha sound technology. Located to the left and right above the panel. Supplements the stereo effect of the main speakers for the person playing. When Voice Guide is active, the Electone speaks information from the current display or operation being executed. This allows those who have visual impairments to enjoy playing and using the instrument. *When using Voice Guide, make sure that the USB flash memory containing the Voice Guide files is connected to the instrument. *The audible information of the functions/screen supported by the Voice Guide is limited. *The Voice Guide file is common for ELS-02/02C and ELC-02.